Description: Excellent condition, only a couple of tiny bobbles! 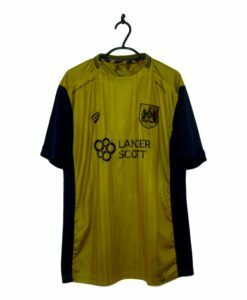 The 2004 Bristol City ‘100 Years At Ashton Gate’ Shirt has a dark red base colour but features the names of all 762 former players that played for Bristol City at Ashton gate between 1904-2004 in white. A special Bristol City Ashton Gate 1904-2004 badge is placed in the centre of the chest. White ‘BCFC’ lettering runs across the middle of the football shirt. The collar is white with red trim whilst the trim on the cuffs is red and white.